We have an amazing opportunity to help win the war against ALS, Lou Gehrig’s disease, by supporting Augie’s Quest, a foundation created by one of the fitness industry’s leaders, Augie Nieto. Augie was a very healthy and fit man when he was diagnosed with ALS in 2005. This debilitating disease has robbed him of his ability to walk, speak and eat on his own, but he has found the strength to develop Augie’s Quest. Through this foundation, Augie raised $41,000,000 and has given so many people hope for a cure! XSport Fitness continues to expand throughout the Chicagoland, New York and Washington D. C. markets with three new facilities – an 8% unit increase. This comes on the heels of three clubs opening in the first half of 2014 in the Chicagoland and D.C. markets. All new locations include boutique fitness programming while maintaining the high quality traditional health club amenities to meet and exceed the demands of today’s fitness consumer. XSport Fitness plans to open three new facilities by 2016. These full-service locations include: Melrose Park, IL by year end 2014, Bronx, NY by Q4 2015 and Fort Totten, D.C. in 2016. 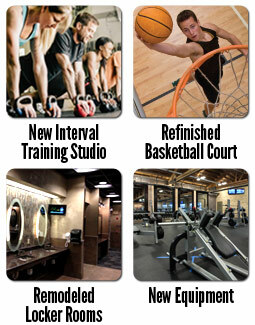 The Pipers Alley XSport Fitness club, located in Chicago’s Old Town neighborhood, received a $1.5 million dollar makeover throughout the first half of 2014. Among various cosmetic upgrades, floor refinishing, locker room remodeling and equipment upgrades, the club now features a boutique fitness center Interval Training Studio. The X-IT Interval Training program features heart rate-based training and top-of-the-line equipment within the walls of a full-service health club facility.